The University of Copenhagen plays a central role in an ambitious Microsoft multi-million dollar investment. Today, the tech company and the University signed a long-term collaboration agreement on the development of a general-purpose, scalable quantum computer. This is a project which opens up tremendous new opportunities for science and technology. 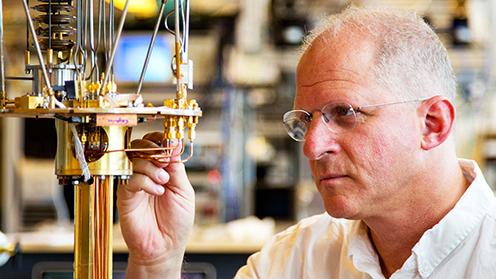 The Niels Bohr Institute’s Centre for Quantum Devices (Qdev), headed by Professor Charles Marcus, will be pivotal in the collaboration between Microsoft and the University of Copenhagen. By virtue of a new collaboration agreement with the University of Copenhagen, Microsoft is intensifying its investment at the Niels Bohr Institute. Microsoft employees will be working closely with the Institute’s researchers to develop and build the world's first general-purpose, scalable quantum computer. The task for the Microsoft employees is to turn knowledge gained from research into tangible reality. The announcement of this deepened partnership, which includes the expansion of facilities at the University’s North Campus, will further establish Niels Bohr's Copenhagen as a global epicentre for quantum mechanics in perfect alignment with the vision of Greater Copenhagen as a global hub for science and innovation. “The University of Copenhagen’s quantum research contributes to placing Danish research at the very top, which was evidenced today by the IT giant, Microsoft, expanding its investment in a Quantum development centre in Denmark. It’s a perfect example of how a university can create value in collaboration with the business sector from all over the world,” says the Danish Minister for Higher Education and Science, Søren Pind. For Thomas Bjørnholm, Prorector for Research and Innovation at the University of Copenhagen, today's multi-year agreement with Microsoft is the culmination of a sustained and extremely focused research partnership within quantum technology. “When a company such as Microsoft chooses to situate and invest heavily into a research development center at the University of Copenhagen, it’s because we’ve had a significant focus on building up one of the world's leading quantum research environments. We’re very proud of this and are confident that it will reinforce a strengthened perception of Denmark as an attractive destination for international investments,” the Prorector says. The Niels Bohr Institute’s Centre for Quantum Devices (Qdev), established by the Danish National Research Foundation and headed by Professor Charles Marcus, will be pivotal in the collaboration between Microsoft and the University of Copenhagen. The research at the Institute draws on Niels Bohr's own research into quantum physics and is amplified by Microsoft’s investment in state-of-the-art laboratories and specialized Quantum equipment and tools at the University of Copenhagen over the coming years. This, in turn, makes the University of Copenhagen and Denmark an increasingly attractive destination for global Quantum talent. “The critical pillars for successful and productive Quantum research already exist at the University of Copenhagen – an aligned vision between Microsoft and the University, an exceptional team of top Quantum researchers, a broad and deep pool of post doctorate and student talent, and a solid baseline of facilities and equipment dedicated to Quantum research. We look forward to harnessing this to make impressive advancements in the research and development of a useful, scalable quantum computer capable of transforming the global economy and solving the world’s hardest problems," says David Pritchard, Chief of Staff for the Artificial Intelligence and Research division at Microsoft. Together with the effort and activities across Qdev and Microsoft, the other quantum research centres at the University of Copenhagen, including the Centre for Quantum Optics (Quantop), the Centre for Quantum Photonics, the Villum Centre for the Mathematics of Quantum Theory (Qmath) and the Quantum Innovation Centre (QuBiz), will augment the open Quantum research that the University will generate, further propelling the University into the global Quantum spotlight. In addition to establishing ‘Station Q Copenhagen’ via this new chapter of Microsoft and the University’s partnership, Microsoft has also established partnerships with universities in the Netherlands, Australia and the United States. Station Q Copenhagen is one of only four prestigious experimental Station Q sites in the world, alongside Purdue University, Delft University of Technology, and the University of Sydney. Computers based on quantum technology have the potential to solve and execute complex mathematical calculations much faster than any existing computer built with ordinary bits. Bits that are based on quantum particles, known as qubits, will --when stabilised and integrated into a computer-- generate unprecedented performance. This will translate into the ability to create significant opportunities and tackle pressing challenges like global warming, material and drug design, IT security and encryption, and more. • Microsoft is establishing state-of-the-art Microsoft research and development laboratories at the University of Copenhagen North campus in close proximity to the Niels Bohr Institute. • Presently, over a dozen Microsoft employees ranging from engineers to developers are situated at the University of Copenhagen. Over the course of the new long-term agreement, the size of this team will grow, partnered with University personnel in the development of a topological quantum computer. • In addition to the multi-million dollar investment in state-of-the-art facilities and equipment, Microsoft is also committing to significant quantum research funding at the University of Copenhagen. • The collaboration between the University of Copenhagen and Microsoft will be based at the Centre for Quantum Devices (Qdev) and helmed by Professor Charles Marcus. Charles Marcus is Microsoft’s Scientific Director of Station Q Copenhagen. • An agreement capturing the elements of the collaboration has been signed covering the license rights to Microsoft and the University of Copenhagen. The agreement reflects the interests of the parties and takes into account applicable legislation and guidelines in this area. The collaboration between the University of Copenhagen and Microsoft is a landmark example of the science and research made capable by joining public and private interests. Together, via this new phase of the partnership, the team is poised to make critical strides in topological quantum computing in furtherance of the quantum economy – locally and globally.